Rockcliff Identifies Gold Along a 10-Kilometre Long Horizon at the SLG Gold Property, Snow Lake, Manitoba — Rockcliff Metals Corp.
Rockcliff Metals Corporation (“Rockcliff” or the “Company”) (TSX.V: RCLF) (FRANKFURT: RO0, WKN: A2H60G) is pleased to announce that geological prospecting has identified the "McLeod Gold Horizon", more than a 10-kilometre long mineralized corridor associated with gold and copper mineralization on the Company"s SLG Gold Property. President & CEO of Rockcliff, Ken Lapierre commented: "This strategic property hosts multiple historical gold-rich zones along several regional structural fault splays. The McLeod Gold Horizon has never been drill tested, yet hosts numerous historical gold showings. Rockcliff"s grab samples confirmed the presence of high-grade gold and copper mineralization. In 2019, we plan to advance this gold asset with additional surface work in preparation for a drill program focusing on top priority gold targets." 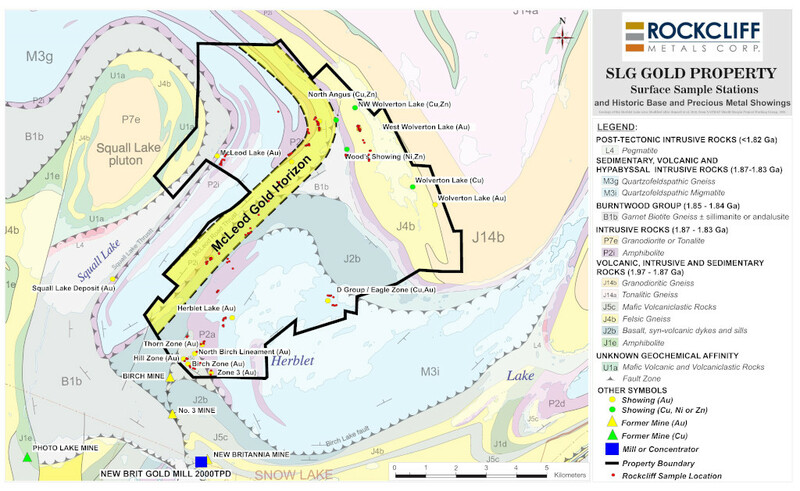 The SLG Gold Property is part of Rockcliff"s extensive property portfolio within the Snow Lake mining camp, which includes Manitoba"s first and highest-grade former gold mine and some of the highest-grade copper-rich and zinc-rich Volcanogenic Massive Sulphide (VMS) deposits within the prolific Flin Flon–Snow Lake greenstone belt. Rockcliff"s rock grab samples yielded from trace to 235.6 g/t gold and from trace to 2.41% copper. Rockcliff"s rock grab samples yielded quartz vein material grading from trace to 19.58 g/t gold. Zone 6: 61.83 g/t Au across 0.41m (BIR11-12). Figure 1 - Plan map illustrating Rockcliff's sample locations, and the historic gold and base metal showings. Click image or link here to view larger. A total of 206 rock grab samples were taken in the field, packaged and shipped directly from Rockcliff"s field office to TSL Laboratories (TSL), Saskatoon, SK. TSL is a Canadian assay laboratory and is accredited under ISO/IEC 17025. Each bagged rock sample was dried, crushed to 70% passing 10 mesh and a 250 gram pulp was pulverized to 95% passing 150 mesh for assaying. A 0.5 g cut was taken from each pulp for base metal analysis (if needed) and leached in a multi acid (total) digestion and then analyzed for copper, lead, zinc and silver by atomic absorption. Gold concentrations were determined by fire assay using a 30 g charge followed by fire assay gravimetric and atomic absorption finish. Samples greater than an upper detection limit (3000 ppb) were reanalyzed using a 1 AT charge. Rockcliff inserted certified blanks and standards in the sample stream to ensure lab integrity. Rockcliff is a well-funded Canadian resource exploration company focused on base metals, gold and royalties in the Snow Lake area of Manitoba. Rockcliff"s extensive portfolio of properties totals 169,000 hectares and includes 8 of the highest-grade undeveloped base metal deposits as well as Manitoba"s first and highest-grade historic gold mine. Rockcliff"s goal is to be known as a Canadian mine finder with ultimate conversion of its projects into cash generating royalties.